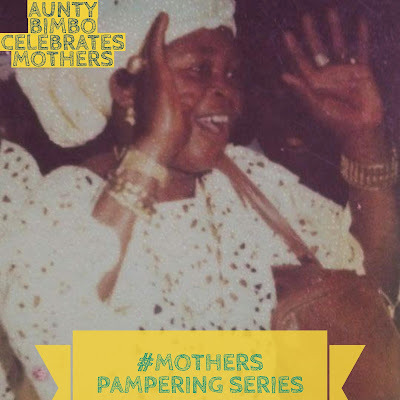 It is not unusual to see women gushing about their mothers but when men publicly declare how much their mothers mean to them, it is indeed worth celebrating. This is why today on the Mothers Pampering Series, we are celebrating Alhaja Rafat Alake Mogaji. She is the mother of a former colleague of mine, Rilwan Tokosi. I have known Rilwan for about 11 years now and we worked together for about 5 years and I always saw how much he loved his mother and was so devoted to her till she passed on a couple of years ago. According to him, Alhaja Rafat Alake Mogaji (Nee Idris) was a selfless mother who raised him and his brothers at a time when things were quite challenging for the family. However, he was shielded with so much love and affection that he could not tell much of the difference until much later in life. "My mum denied her self a lot of luxury just to see me raised as a successful child and she instilled religious values in me very early in life and this always guided me anytime I was going astray even till date. I had a lot of reasons to have been swayed by peer pressure but for my strong religious foundation which was impacted by my mum. She also taught me discipline early in life because of her career with the Nigerian Army and even though she is gone now, I still miss her and will forever cherish her because she is a major factor in who I have become in life.